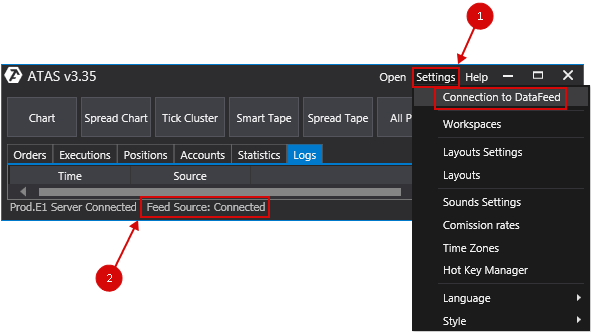 Go to the main window menu - Settings, then the submenu Connection to DataFeed. Click the left mouse button on the lamp connections in the main window platform. To add a new connection press Add button. 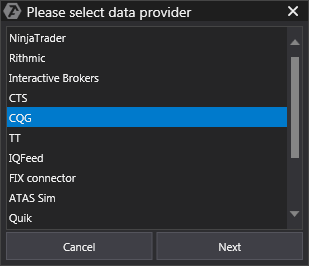 Now choose CQG connection and press Next button. Enter your personal data and e-mail and press Register demo button. Your credentials will be generated, boxes in the previous tab will be automatically filled and connection will be created. Notice! 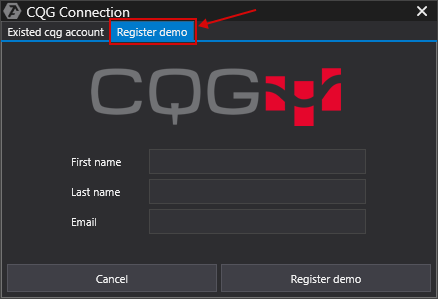 Data of CQG demo access received at the registration using the interface of ATAS platform may not work in other platforms. Besides, CQG demo accounts received from other sources may not be supported by ATAS platform. This results from the policy and rules of granting demonstration accounts by CQG company. A demo account is given for the period of 14 calendar days after which you can register again using the same registration data. When connection setting is done, press Connect button next to CQG connection. *After connection is set up please wait a minute before clicking Connect button. Important: for the Russian and American markets should only be connected to one source quotes!